I’ve spent a good deal of time on the road recently. Or to be more accurate on the road and on the rails. It started on February 6th with a visit to a library, for National Libraries day. I was met at the library entrance by one of my favourite book characters. 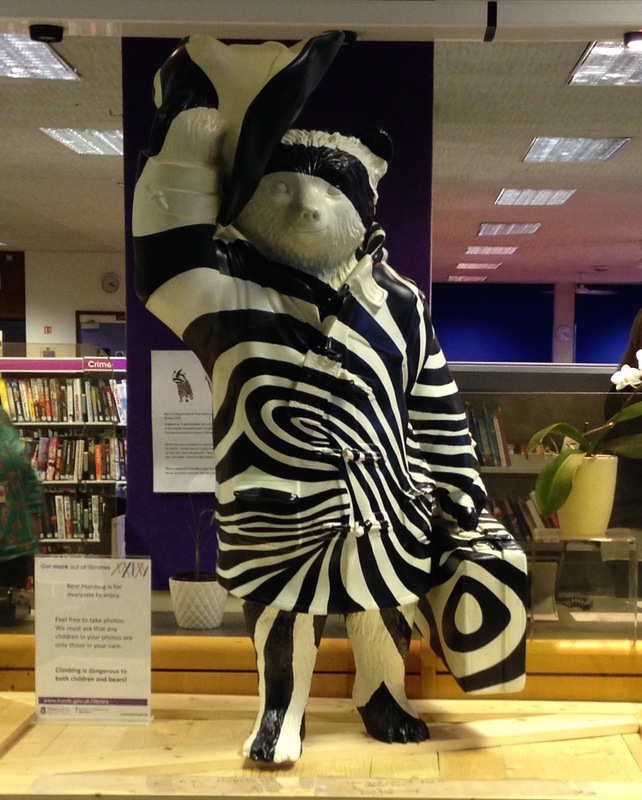 This ‘zebra’ Paddington (Bear Humbug) was one of more than 50 Paddington Bear statues that formed part of a trail in London back in 2014. This week just ending was particularly manic as, like many other writers, I hopped from school to school to take part in World Book day celebrations. I’ve had SO much fun. But I’ve also had lots of very early mornings, long days and the torture of train travel during the rush hour. I could write a whole blog about train travel. It brings out the very worst in human nature but also the very best. To the commuter who barged past two young school girls to beat them onto a very crowded train, SHAME ON YOU. And, to the man who I trod on twice when the train went over a bumpy bit, (I was too short to save myself by grabbing the hand rail), THANKS for being so nice about it. 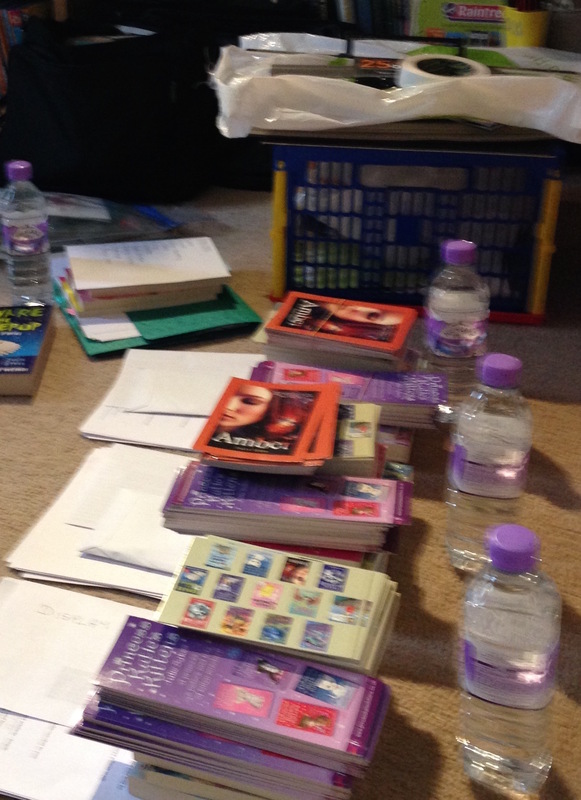 During my travels my office floor looked like this. Last Friday, when I wasn’t out on a visit, I decided to have a clear out. I took 3 big bags of books down to our local book bank. I hate getting rid of books but it had to be done and the brilliant thing about it was that I managed to put my ‘to read pile’ ON the bookcase next to my own books. (This is my physical to read pile. Let’s not go there with my electronic one). I’ve got one more visit next week and then I’ll be back at my desk again. I’ll miss the excitement of being out and about and meeting such wonderful readers but I won’t miss being part of the daily commute. Now, you may have noticed that I didn’t mention in which library I met Paddington Humbug. There’s a reason for that. I’m going to send a copy of Tales From the Crystal Caves (3 stories about my own Fairy Bears) to the first person who emails me at author@juliesykes.co.uk with the correct answer. (HINT – I blogged about it last month). What’s top of your ‘to read’ pile? Is it a real book or an electronic one? 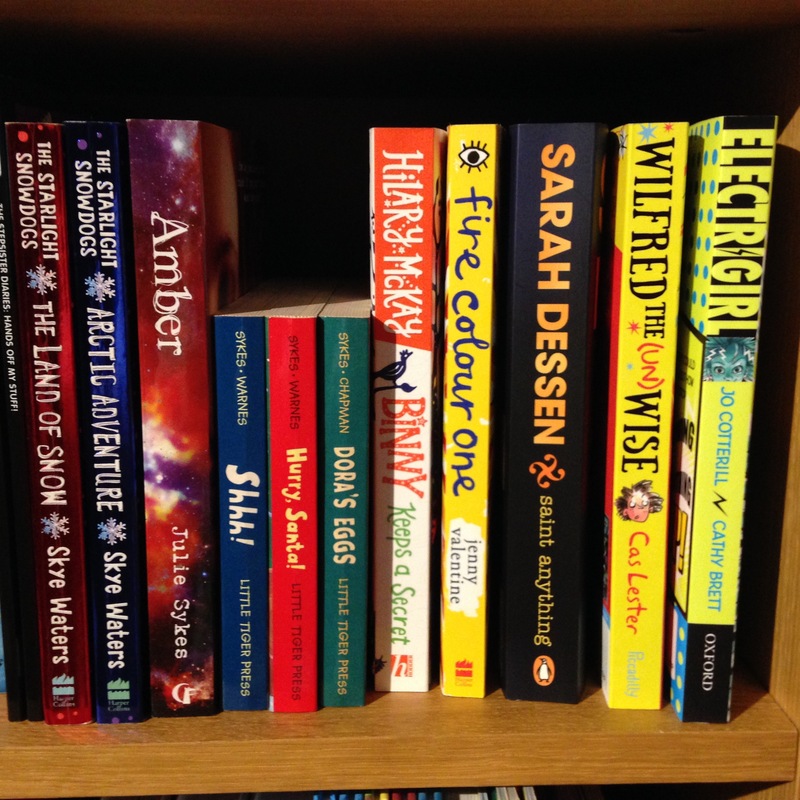 Tags: libraries, out and about, trains, travel, visits, WBD. Bookmark the permalink. My read pile is mostly paper books and it’s so high I can’t even see the top – BUT it’s mother’s day tomorrow . . . and that means I get to read all day – and in my PJs if I want to! HUZZAH! Bring on that reading pile. And is it too late to say SHAME ON YOU to the man who (like the man in your post) barged in front of me and my double buggy and who actually fell on my sons in his haste to get into a shop in front of me? It was many years ago but his selfishness astounds me to this day. BTW I did not say ‘Shame on you’ – I said something much ruder. What? That’s appalling. I hope your boys were okay? Bring on that reading pile. Have a great day, tomorrow. Julie, I’m in awe at your organisation!